Depending on where you live, the severity and reputation of hard water may vary greatly. However, it is something that affects most homes to some degree. 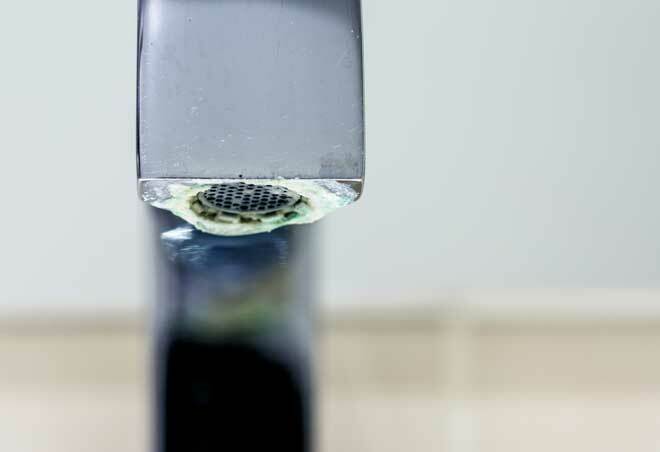 Why should you be wary of hard water, and when is it appropriate to invest in water softeners? Hard water contains abnormally high levels of calcium and magnesium. Although some estimates place homes affected by hard water at as much as 85 percent, some homes are more affected than others. Homes which have heavier water can suffer numerous issues and affect both your health and finances. Why is Hard Water Problematic? The mineral content in hard water erodes and clogs pipes, decreasing the efficiency of your home plumbing and creating unsightly limescale. In addition, the minerals are abrasive and can damage glass, fabric, and even your skin. The cumulative effects caused by hard water can increase your expenses for everything from appliance maintenance to damaged clothing and dishes, more frequent purchases of bath and skin products, and higher water bills. While you may think water softeners are a liquid, it is actually an appliance which hooks directly into your water supply lines. These appliances replace the calcium and magnesium ions with sodium or potassium ions. While the process has become more efficient in recent years, it may still use as much as 25 gallons of water per day. Please note that some states and localities have regulations regarding the use of specific types of water softeners. Unlike many potential household threats, testing for hard water can be done in a variety of ways. Whether you use one method or several may depend upon the condition of the house when you moved in, how common hard water problems are in your neighborhood, or even as part of a periodical inspection for signs of trouble. Limescale is a chalky white buildup which most commonly appears on shower walls and faucets. Formed by the calcium and magnesium, scale is also responsible for the appearance of water spots on dishes. Seeing a white buildup around the tip of your faucet or around its base can be an indicator of further buildup within your pipes. This buildup can sometimes be accompanied by lower water pressure due to mineral clogs. Hard water can cause the colors to fade in fabrics, as well as making them feel more scratchy. This occurs due to the abrasive quality of the mineral content. Many laundry detergents are available with liquid water softeners added to help offset the effects of hard water. One of the many side effects of hard water is the increased fragility of glassware. When exposed to excess minerals in the sink or dishwasher, glassware can become stained. The abrasion can also weaken the surface, making it easier to break. Stains can be removed by using vinegar in the dishwasher or when soaking in the sink, although the problem will continue as long as you have hard water. The frequency of plumbing-related repairs and reduced water pressure are both signs of hard water. 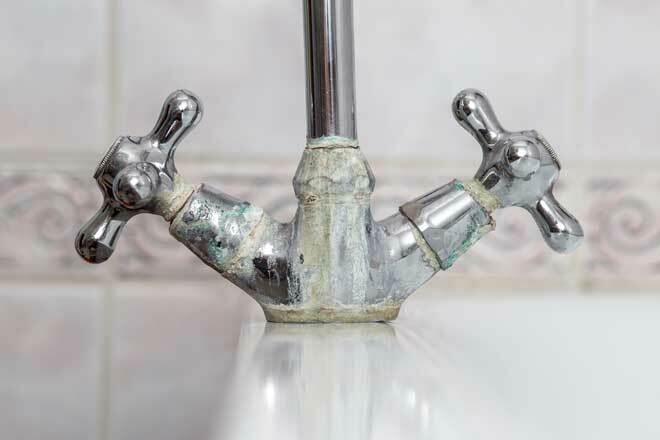 Limescale can wreak havoc on your pipes, especially steel or iron. While copper and PVC pipes are more resistant to buildup, they can also become clogged over time. As scale begins to clog the pipeline, it reduces water pressure and allows the process to accelerate. 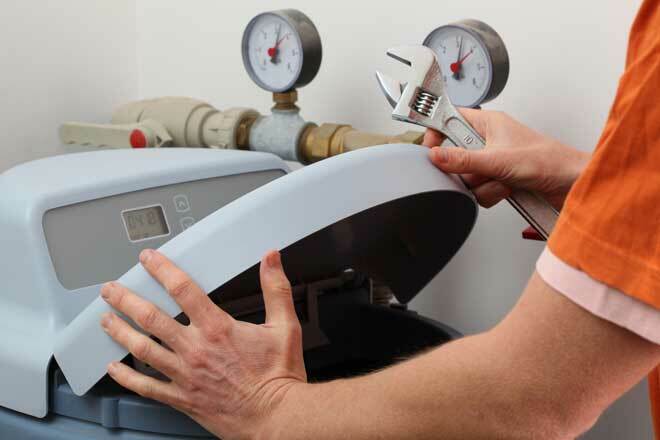 The process can also block valves, causing appliances to leak and need more frequent repairs. One common sign of hard water can be found by examining your water bills. Rising meter counts which do not reflect your actual usage may be another sign of heavy water. As the mineral content affects water pressure and damages your pipes, you may be inadvertently pulling more water into your home to achieve the same amount of output in your tub, toilet, or sink. It is generally recommended that you flush your hot water heater once or twice annually to remove any sediment from the bottom. Excess sediment can absorb heat from the water. With enough buildup, the sediment may even harden, reducing your heater’s lifespan. As hard water contains calcium and other sediments, you will notice more sediment during flushes if you have hard water and may need to flush more often. When water dries in your sink or tub, you should not be able to see white outlines or stains. These are caused by minerals being left behind after the water evaporates. Vinegar is an easy way to wipe away these stains, although they will not eliminate the underlying problem. The excess minerals in hard water can prevent soaps and shampoos from properly dissolving. As a result, your hair can become dry and brittle. Pores can become blocked, leading to blackheads. Meanwhile, your skin may feel dry, irritated, itchy, or rough. If you are experiencing these symptoms at home but not when visiting a stylist or someone else’s home, it may be a good indicator of hard water. When in doubt, water test kits are an excellent way to determine multiple potential water problems. These may usually be obtained from a hardware store. You will get a rating based on the number of grains per gallon (GPG) which is important in deciding whether to get a water softener. A more basic test for hard water simply requires an empty water bottle and dish soap, although this will not inform you of other potential water issues, such as bacterial or chemical content, nor will it give you a GPG rating. Merely having hard water does not always mean you need to invest in a water softening system. In some cases, the hardness of your water supply is manageable with only simple tools such as vinegar or a change in detergents. At other times, intervention may be the cheaper option over time. Cation Exchange: This type of system is considered the most effective, but is also expensive and best reserved for severe hard water cases. The system replaces the calcium and magnesium ions with sodium or potassium ions. Due to the higher salt content, sodium-based cation systems are restricted in some areas. Non-Sodium Conditioner: An alternative to the sodium-based system, these condition the water instead of using ion exchange. As a result, there is no additional electric or water usage and no additives. However, it is not as effective and does not actually reduce the hardness. Instead, it crystallizes the sediment, so it won’t affect your pipes. Magnetic: This is a quick fix method which lowers hardness for up to 48 hours at a time. It is best used for mildly hard water and uses magnets to polarize water. While cheap and easy to install, this method uses electricity and will affect your bills. The average person uses approximately 80-100 gallons per day. Multiply this by the number of people in your household. Multiply that number by seven to get an average weekly household usage. Use a water test kit to determine the average grains per gallon (GPG). The nationwide average is 10, but can range from 3 (very soft) to 20 (very hard). Multiply your weekly household usage by your home’s GPG rating. The system’s capacity should be the closest to this number without going under. If the GPG is over 8, you will need a sodium system. Any time you are showing multiple symptoms, and the degree is moderate to severe, you will likely need to use a test kit. Ratings over 8 GPG will require a water softener, and a rating slightly below may also benefit from one. Frequent scale buildup is also a clear sign that a softener is needed. One of the most important reasons to forego a water softener comes down to state and local regulations. The sodium content of treated water is a matter of concern to both environmental and government agencies, as the effects of sodium-infused water on wastewater treatment has not yet been determined. You may also be restricted to certain types of water softener. Another good reason to avoid getting a water softener is related to the cost versus the effects. Water softeners use up to 25 gallons of water per day to run, which will be reflected on your water bill. This might end up reducing your bill for very hard water, but may cost more if your water is rated below 6 GPG.